Hermeticism and the Hermetic tradition are philosophies deeply engrained in much of western magic and mysticism, including Alchemy, Qabala, Astrology, and my favourite, Tarot. The tradition is named for Hermes Trismegistus, who’s the credited author of the Hermetica, a series of ancient spiritual texts. To honour Hermes Trismegistus and his Hermetic legacy, Andrew McGregor and The Hermit’s Lamp is presenting Art in the Hermetic Tradition. It opens Thursday, June 14th at The Hermit’s Lamp and features art by Xris Kukiel, Claire Weigel, Aaron Cunningham, Elizabeth Owen, Gregg McGivern, Franklin Reeves, and Andrew McGregor himself. And guess what? I’ll be part of it too!! Ivan Minsloff and I will be debuting our Hermit silk-screen poster print at the show. I couldn’t be more excited about it!!! The show will run through July 28th, but if you’re in Toronto June 14th, think about joining us at the opening night reception. I’d love to see you there. 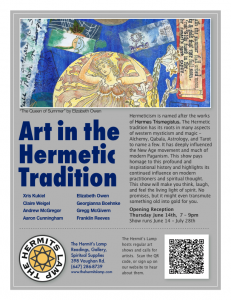 You are currently reading Art in the Hermetic Tradition – Toronto, Jun 14 to Jul 28 at The Tarot Room.